Starting a fund at our Community Foundation is easy to do. It takes about as much time to start a fund as it does to open a new bank account. Unlike incorporating your own charitable foundation (which involves writing articles of incorporation and by-laws and filing with the IRS), establishing a donor fund is simple and economical. All donations to our Community Foundation for your fund are fully tax deductible as allowable by the IRS in the calendar year in which the donation is made. 1. Determine what kind of fund you would like to establish (see Type of Funds). 2. Select a name for your fund. Many donors name their funds after themselves (e.g., Bob and Susie Jones Fund) or their families (e.g., the Jones Family Fund). Other donors try to capture the spirit of the fund (e.g., Bright Horizons Scholarship Fund). 3. Review the New Fund Agreement paperwork with a staff person at our Community Foundation and your financial advisor or attorney. Complete the paperwork, sign and have a Community Foundation staff person counter-sign. 4. Determine how much you want to give. The minimum amount to establish a named endowment fund is $5,000, except for scholarship funds which require a minimum of $50,000. 5. Make your donation. 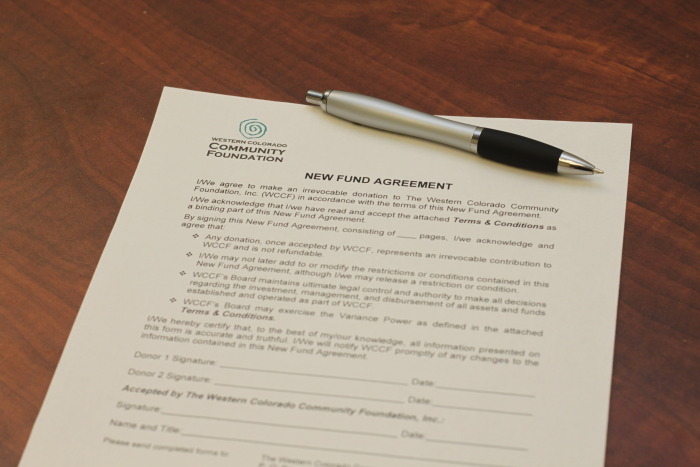 Checks should be payable to the Western Colorado Community Foundation with the name of your new fund in the memo line. If you want to make a stock gift or donate other assets, please contact our office at 970-243-3767. 6. You may make additional donations to your fund at any time, in any amount. Other people can also donate to your fund. 7. Consider making an additional donation to your fund as part of your will or estate plan. Please contact our office to discuss your fund and receive a copy of the New Fund Agreement paperwork we will need you to complete.